Apple today announced CarPlay, a bridge that will let drivers user their car's infotainment center to access and interact with their iPhone. In order to work, CarPlay must be installed by the car manufacturer and a separate app must be installed on the iPhone. Drivers can use the car-based controls, such as steering wheel buttons, to launch Siri (Apple's voice-activated assistant), which can then access contacts, make calls, and listen to voicemails. Siri will read incoming messages aloud at the user's request, as well as dictate spoken messages for replies. CarPlay ties into Apple Maps, and can access recent trips, or addresses buried within emails or text messages, as well as plan and route turn-by-turn directions. Apple Maps will appear on the car's built-in display. 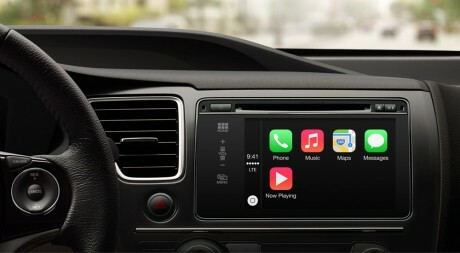 CarPlay also gives drivers access to all their music, audiobooks, iTunes Radio, and podcasts with on-screen navigation or through Siri. According to Apple, Ferrari, Mercedes-Benz, and Volvo will be the first to add CarPlay to their vehicles. Other car makers, including BMW, Ford, General Motors, Honda, Hyundai, Jaguar Land Rover, Kia, Mitsubishi, Nissan, PSA Peugeot CitroÃ«n, Subaru, Suzuki, and Toyota, will follow down the road. CarPlay will be enabled in iPhones through a system update. Microsoft's Skype team today announced yet another update to its mobile application for the iPhone. Skype version 5.2 adds several new features, including new support for voice messages, which are automatically added to text conversations. Yuck! Why would I ever want to integrate my vehicle with Apple Maps. Google Maps integration is the only thing that even makes sense. You can take your proprietary crap and shove it Apple. So, can any auto manufacturers who wants to shove this crap down my throat. Support an open platform that allows me to bring a device of my choosing or lose my business, plain and simple. its clearly not gonna be something for everyone but theres still A LOT of people that love iPhones and are gonna only have iPhones the same with every manufacturer. I don't get why Car manufactures want to tie their cars infotainment center to one mobile OS, because cars last 20+ years. In 20 years that infotainment center could be useless because iOS is dead, or iOS has change so much it can't or wont support it. Heck even in 10 or 5 years from know that field could be completely different and then the infotainment center is dead. Why not develop a open standard infotainment center that works with all phones? it' all about the money! In other words, this is a feature to consistently integrate the iPhone with various infotainment systems instead of each manufacturer taking bits and pieces of iOS navigation and trying to work it into the universally terrible in-car infotainment systems. If you want to know why so many automakers would focus on implementing this, well, it's not exactly rocket surgery.